I just discovered why I have been spending more time in the kitchen: I spend less time "maintaining" our house. I've been getting back into more baking, more exciting dinners, and finding my rejuvenation in the kitchen again. Ahhh....it is a very satisfying feeling. And the kids feel it too. They've pulled their aprons out of the pantry (now they are hung on a hook instead of in a pile!) more in the past few weeks than they have in the past 9 months. 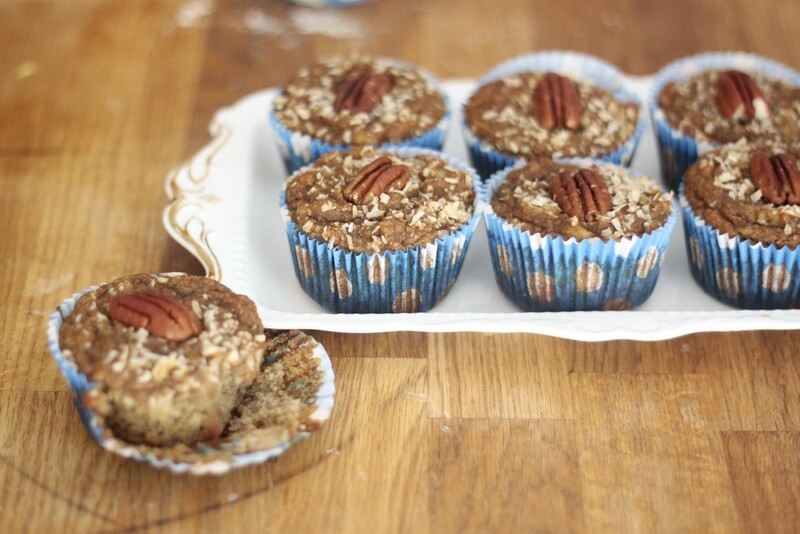 And as always, let the kids help pour, stir, and top with coconut + pecans or walnuts. 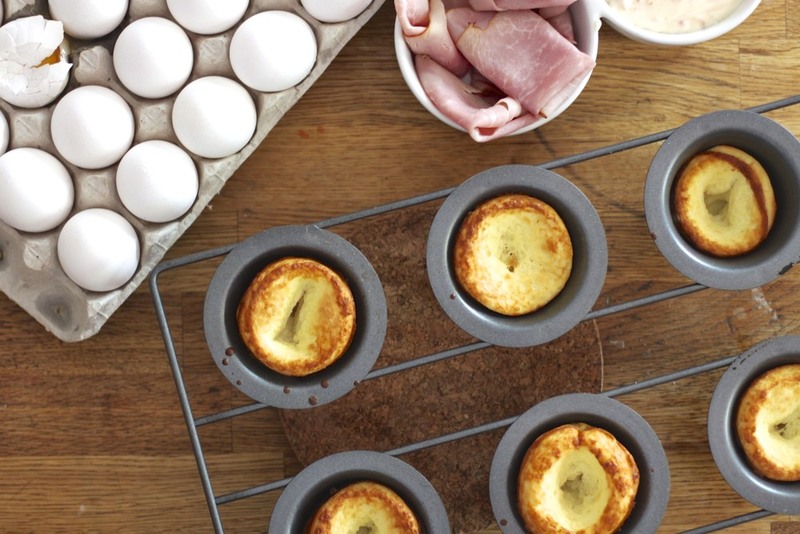 These muffins come together in just minutes. These are quite substantial and very moist on their own but we love a little dab of butter spread over the warm muffin. Quite heavenly. How do you use up ripe bananas?? I loved having aunts come up to join us for the day. Sisters working hard in the kitchen to prepare special foods. Seeing many handmade gifts opened by the couple from both sides of their families. And having my home overflowing with many people that love Travis and Meghan. Such a good day. And the remnants of hanging flowers remain on my walls for a bit longer just to keep the magic in our home longer. This has been the summer of wraps. Sometimes I make my own wraps other times I buy them. (I like [amazon_link id="B00B64Q2NS" target="_blank" ]these[/amazon_link].) I love filling wraps with whatever leftovers I have in the fridge or sauteing up some veggies, adding them to eggs, and piling them in a wrap. Our (very small) garden harvest has made me want to skip time over the stove and just enjoy the produce fresh. With some cucumber + little effort, these Greek Garden Wraps + Cucumber Tzatziki Dip are absolutely amazing, fresh, and so flavorful! 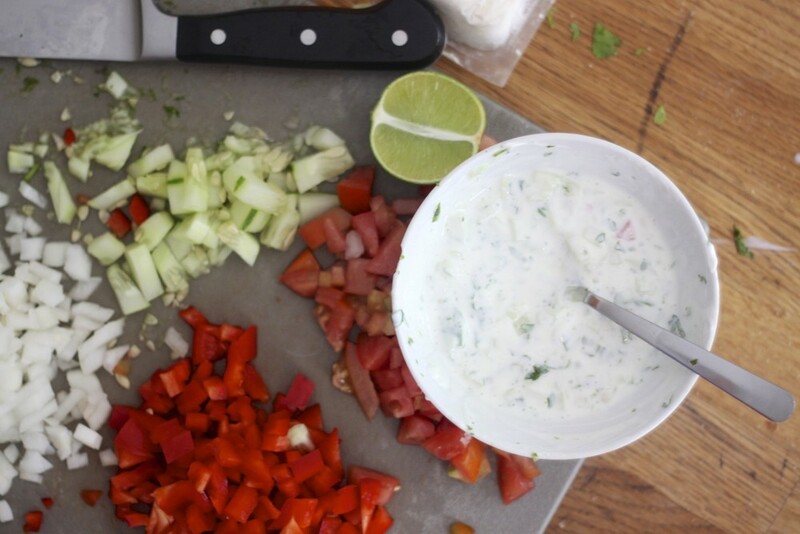 I love the combination of fresh vegetables to the crisp and cool cucumber tzatkiki dip. The goat cheese balances out all of the exciting flavors and the turkey is the substantial protein that leaves you feeling quite satisfied. I hope you give these wraps a try for lunch. You can store all of the ingredients individually to serve up as a wrap bar for friends or family to pick and choose their own toppings. Seriously one of the most flavorful things I've tasted all summer. Thanks to you interested Instagram followers, I am sharing this wonderful summer treat with you this morning. 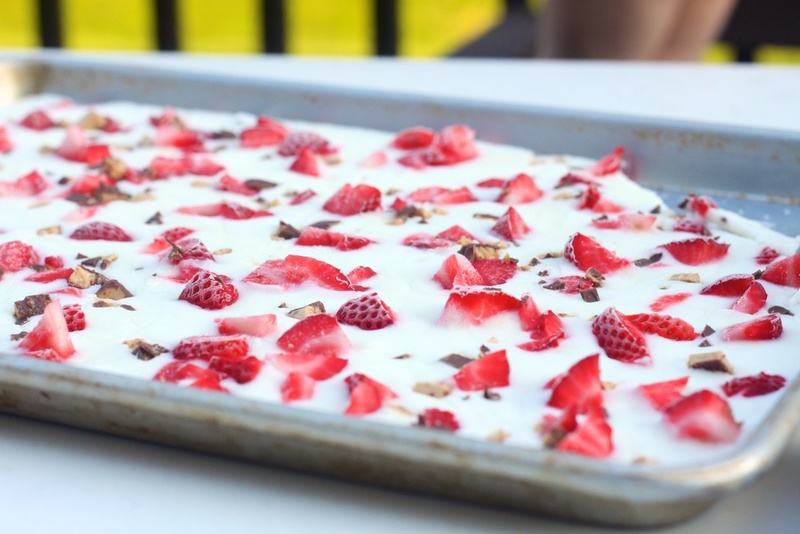 This Healthy Frozen Yogurt Bark is very simple to make and can be enjoyed as a snack or fancy summer dessert. I love the contrast of white with red and how healthy this bark truly is--seriously, if you ate 1/3 of the whole batch it's 26 grams of protein and less than 200 calories! You can control the sugar/sweetness based on your preference. The sweetness comes from honey, stevia, + the toppings you choose. I used roughly 1 TBSP of honey in the recipe with some vanilla liquid stevia for a lightly sweetened yogurt base before adding the toppings. You can customize the toppings for the bark before you pop it into the freezer too. Use whatever fresh fruit, roasted nuts, or chopped chocolate you have on hand. It is such a grand thing pulling that sheet of frozen yogurt bark out of the freezer. All of my kids were amazed. It's fun letting the kids help you break up the bark. And because it's super healthy, they can break + eat as much as they want! I like the bark best 1-2 minutes after it's come out of the freezer. It isn't too cold and is just beginning to soften so eating it is quite refreshing. It's the day before the 4th of July and we are beginning to talk about what our annual red, white, and blue dessert will be for tomorrow's festivities. I like that life is always changing and evolving, especially when you have kids. I think of the hours we've spent some years making dramatic desserts (like above cupcakes) because we were totally into it. And other years--most recently in particular--that more important things have our attention. And so the cycle of priorities is always changing with experiences, maturation, and our family dynamic. I remember Caroline helping me assemble our mini berry cheesecakes last year. She left all of the fun down by the pool with siblings and cousins to help. I know she loves to bake and probably misses it like me. And so these special holidays let us do what we used to do together when that was our priority. It is so important to listen to what we love and are passionate about most of all--to live our present moment with only the most important things taking up our time + physical/emotional effort. Caroline recently was contacted about possibly being a contestant on Food Network's Kids Baking Championship. At first it sounded so amazing and glamorous and a chance of a lifetime. But when it came down to it, baking cakes, decorating with fondant, traveling to be on the show, time away from family, ballet, and her current life wasn't worth it. Nor the hours she'd invest in it. And so, we decided it wasn't essential to her life at the moment and she jumped back into her simple but meaningful 9 year-old life. It takes courage to say no to the non-essentials but that means we can put our whole hearts into the essentials. Becoming more. Giving more. And becoming happier than we ever thought possible because we CHOOSE how to use our own life. I hope you have a special weekend with family + friends and put your whole heart into the things you say YES to! 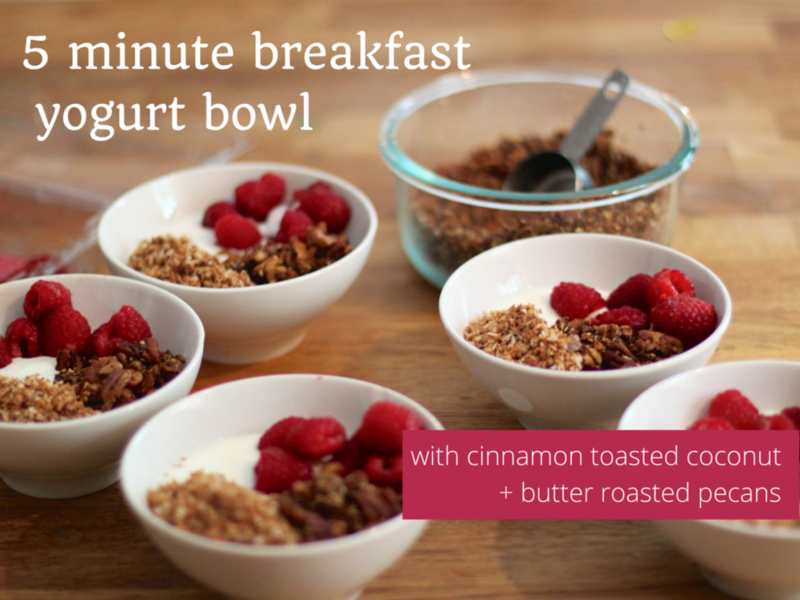 I like to reserve our yogurt bowl breakfasts for the busiest mornings of the week. And for good reason. They require simple assembly + a little toasting of this and that over the stove. By the time the last few stragglers have come downstairs, bowls and spoons are ready to grab and take to the table. One of our standby yogurt bowl combinations includes simply toasted cinnamon coconut + roasted butter nuts. I like to multitask by filling individual bowls with yogurt + berries while keeping an eye on the two pans at the stove. I can have the entire yummy breakfast ready in minutes. And talk about amazing flavors! Warm buttered pecans + cinnamon coconut that are fresh out of the pan with sweet raspberries over yogurt is amazing. I combine any leftover buttered nuts or toasted coconut in a sealed container and keep it on the counter for a later snack. 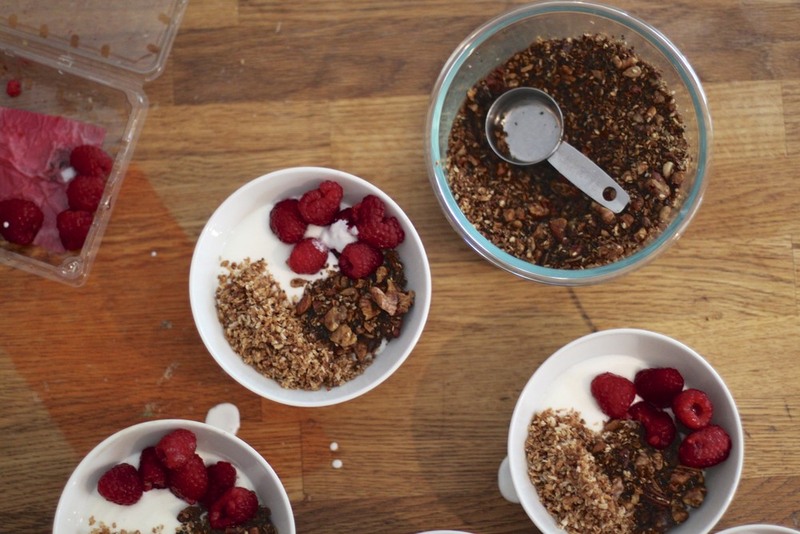 You can add dried fruit for an easy trail mix or add milk and turn it into granola. You can also throw in any type of seeds with the chopped nuts to roast in the butter--talk about protein and nutrients! We love making this stuff. Enjoy trying out a new morning recipe! cutting, hot glueing, and sewing purses + totes daily now that their art room has officially been turned into the "sewing + craft room"--tour coming soon! beginning the life-changing magic of tidying our home (starting with all of the clothes throughout the house) since being completely changed from reading the book, [amazon_link id="1607747308" target="_blank" ]The Life Changing Magic of Tidying Up[/amazon_link]. Caroline, who has listened to some of the audio with me, has taken the book's philosophy to heart and has been going through her own things--pretty amazing. Our June + July will definitely be our busiest months this summer because of ballet. And so I'm carefully + intuitively planning our days now to only contain the most meaningful things beyond the scheduled things: a lot of outside biking time, inspired creativity inside, simple meals + snacks, my most exciting personal goals at the moment, and better flow of maintaining the house daily for them + me. And most importantly, being flexible when we're all together so we can really say at the end of the day (and personally in my 5 Minute Journal at night) that our days + summer has been absolutely thrilling + successful for all of us. Here's a new video with the addition of two of my kitchen helpers. If you can get over their antics (they LOVE seeing themselves live on the screen) you may learn a thing or two to make your kitchen more functional as a whole by putting your kids in charge. Turning your kitchen over to your kids is a win/win situation. 1) It takes the burden of cooking + cleaning off of you as the parent and 2) it empowers your kids to step up, learn essential skills, and thrive on making the family machine function seamlessly. This may be our fourth week without a working dishwasher but new things are happening in the kitchen! My ongoing mission as 1) mother and 2) healthy-food-generator is to come up with new exciting ways to serve up eggs for my kids. Yesterday morning we made popovers for breakfast! And since I have two kids that are tentative about eggy-consistency "baked goods" I knew I'de have to have something pretty awesome to slather over them. So chef Annabelle and I tried to recreate some of the cream cheese spreads we sampled this week from our local farmers market. The chef for the day refused using ANY herbs in the spreads so we came up with two spread everyone would enjoy. They take just a few minutes to throw together and are an incredible, flavorful addition to eggs, toast, or even crackers. Mix well and serve. Chill first for more intense blending of flavors. Give 'em a try and let me know what you think! What flavors would you make? I'd like to make a garden vegetable cream cheese to add to scrambled eggs or for savory crepes. Making some protein-packed, fun energy bar (and keeping it low sugar) is really one of our favorite parts of hiking. I mean, come on. Nourishing, tasty food makes experiences in life exciting and memorable. Since I bake gluten-free and low sugar for my kids, picking up a bag of puffed brown rice from time to time is really fun to experiment with. Because it is just puffed brown rice (with no added sugar), one whole cup of it is 13 net carbs (translation=low sugar). That's roughly the same about of sugar/carbs in 1 cup of greek yogurt. These tasty, colorful bars are packed with nutrient dense ingredients including the perfect amount of protein, crunch, sweetness, and portability for hikes, outdoor adventures, and yes, a simple afternoon snack.